I wanted to give you a little introduction to the oils that come in a Young Living Starter Kit. 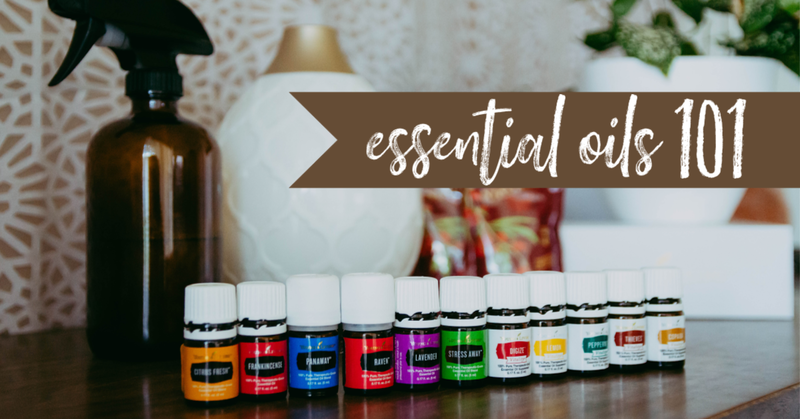 Some people prefer reading to video watching, so I thought it would be helpful to have all the info in my Essential Oils 101 class here in text form. Shall we get started? Essential oils are basically the essence of the plant. Obtained by steam distillation, they are the most powerful part of the plant. They aren't hippy, witchy woo-woo, nor are they some new age fad. Essential oils have been used for thousands of years (hello, 3 wise men, bringing Frankincense, gold, and myrhh to baby Jesus). 3 ways: Inhalation, Topical Application, Ingestion. For inhalation, you can open a bottle and sniff, or add a few drops to a diffuser. Did you know that oils can reach your organs with in 3 seconds when inhaled? How cool is that?! Topical application just means rubbing the oil on your skin. You can do this neat or with a carrier oil. A carrier oil is just another oil that you mix with your essential oil that slows down the process of absorption because essential oils can be absorbed into the body within 26 seconds. It is recommended that young children and people who are new using essential oils use a carrier oil when applying oils topically. Internal uses for essential oils would be to use a drop for cooking, putting it in a vegetable capsule, or a drop in water or tea. This topic can be controversial so please use caution and do your research. I would not use any essential oil internally that was not part of Young Living's Vitality line. Why is Young Living supposed to be so much better than the oils I can buy off amazon? Young Living has a seed to seal promise, no one else has that. 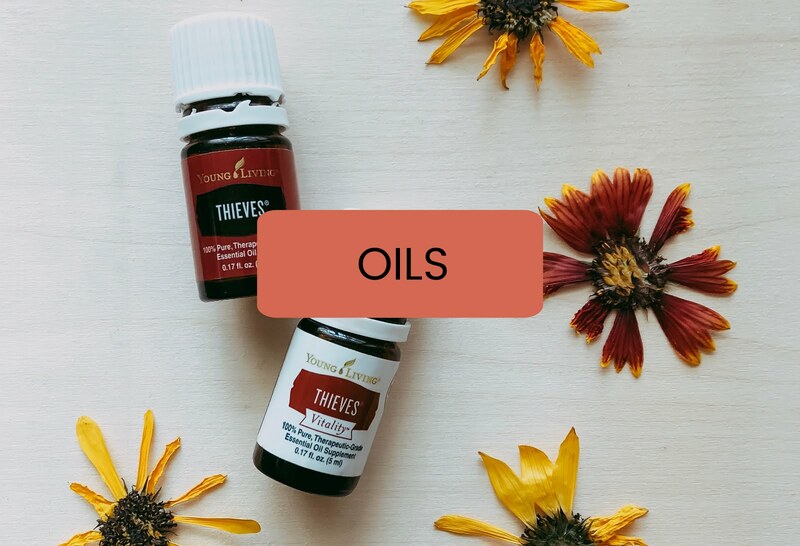 Young Living controls every aspect of their esssential oils from the time the plant is a seed, until it is sealed in the bottle, and they put their oils through rigorous 3rd party testing from accredited, independent labs. Other companies just can't promise that. They either haven't been around as long as Young Living (25 years!! ), or don't have the resources. Since the FDA doesn't regulate essential oils, the oils that you buy from other places, like the grocery store or amazon - even other "natural wellness companies" could be synthetic, adulterated, manipulated, diluted, etc. Smaller companies just don't have the resources to produce the same quality oils as Young Living. There's just no way to know for sure, but with Young Living, you can tour any one of their farms at any time. They provide so much transparency because they have nothing to hide. What can oils do for you? So many things!! From mood boosting, grounding, cleaning, bacteria fighting, pain relieving, seasonal supporting, respiratory supporting, there are thousands of things these brown bottles will do for you. I'd have never believed it unless I tried it, but they really are like little bottles of magic potion. The best way to get started in oils is with a Young Living Starter kit because it's uses are so versatile. A diffuser. You can choose from a few different options - the one pictured is the desert mist diffuser (so pretty!!). Lemon Vitality: Fresh smelling, uplifting, helpful in cleaning (a key ingredient in Theives Household Cleaner). It a natural goo remover, so you can use it to remove sticky labels from jars, etc. You can also add a drop or 2 to water to clean fruits and veggies. Copaiba Vitality: This oil is ahhhmazing!! It is one of the most anti-inflammatory substances on earth. Can be used as an astringent to tighten and strengthen skin, and eliminate scars. Helpful in relieving congestion when inhaled. Copaiba helps to reduce pain and inflammation with little to no side effects. Use it to ease head tension, and loosen muscles. It's antibacterial, antifungal, and a diuretic. This magical little oil contains 20% more BCP than cannabis (beta-caryophyllene "BCP" interacts with cannabinoid receptors in the body, releasing beta-endorphins). Digize Vitality: Great for digestive support. We rub it on our tummies when we're not feeling so well. Smells a bit like licorice. Thieves Vitality: Immune Support in a bottle. Diffuse it, rub it on the bottoms of feet or down spine daily for immune support. It smells warm and spicy and wonderful - like Christmastime in a bottle. The main oil in this magical blend is clove oil, which is higher in antioxidents than any other oil. This is also the main ingredient in Thieves Household cleaner. Peppermint Vitality: Great for nausea, head tension, seasonal support, respiratory support, and is so energizing! Panaway: Holy moly, this oil is so good for sore joints and muscles. It works sort of like those muscle rubs - you know, the ones that tingle and soothe, but are full of yucky chemicals? Well, it's like that, minus the yucky chemicals. Raven: This is the oil that really gave me my first magical oil experience. I'd been sick with a chest cold all week, rubbed this stuff on my chest, and immediately felt it seeping into my chest and giving me relief. Magic stuff, I tell ya. Diffusing Raven is great for respiratory support, and it also provides a cool, soothing sensation when applied topically to chest and throat. Citrus Fresh: This oil is uplifting and great for emotional support. Just be careful when applying citrus oils topically, because they can make your skin more sensitive to the sun. Frankincense: This is like the OG of oils. It can do so many things. I use it in a roller with lavender and a carrier oil on my face every night because it helps smooth the appearance of skin. It is commonly diffused for prayer and meditation because it is very grounding. Frank reduces stress and anxiety, boosts immunity, and reduces pain and inflammations. Lavender: Lavender is the big mamma jamma of the oil family. She can be used pretty much always. Calming, soothing, it's the oil of relaxation. One of the top oils to help the skin, they sometimes call Lavender the "swiss army knife" of oils because you will always find a reason to bust out this lovely. Stress Away: Pretty self explanatory. The main ingredient is copaiba, but also contains lime and vanilla. I sometimes just wear it as perfume when my kids are acting a fool. 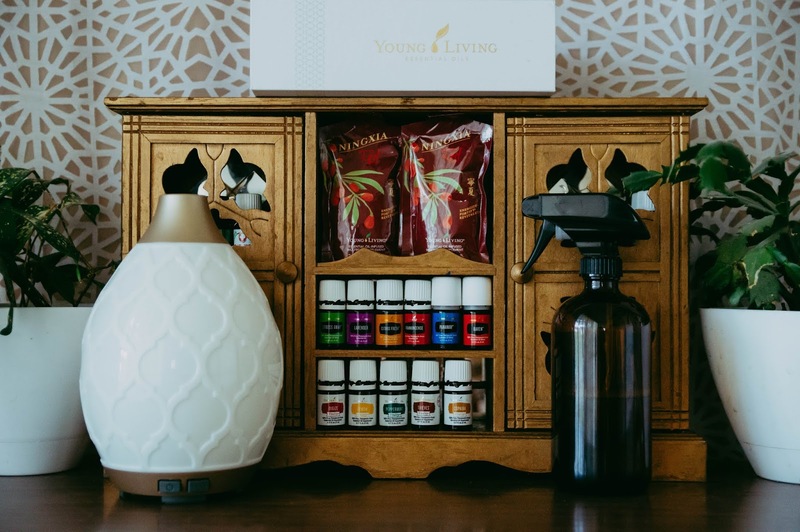 The premium starter kit comes with all of those oils, plus a sample (enough to make an entire bottle) of Theives Household Cleaner, a couple of samples of Ningxia Red, a roller top, and some little bottles so you can share the awesomeness of oils with your friends. 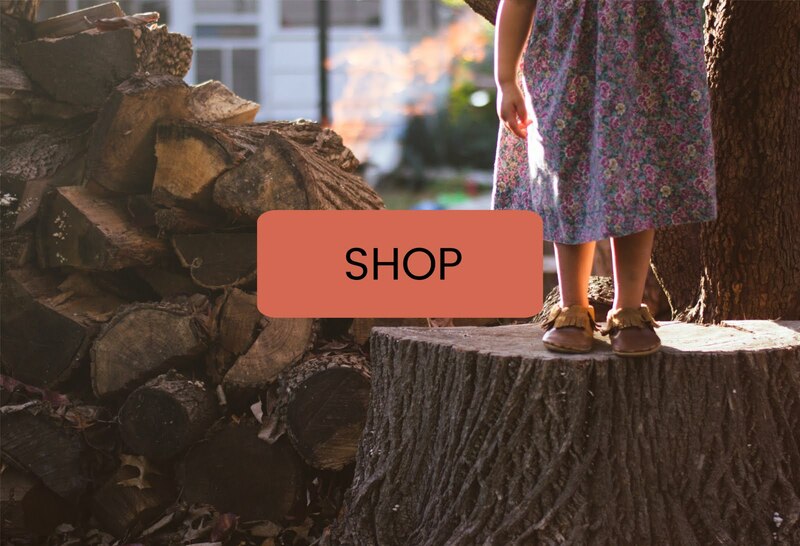 The best part - the PSK give you a lifetime wholesale membership so that you can save 24% off of anything you ever buy from Young Living ever again! There is no obligation to buy anything else, ever, but if you decide you want to start adding to your oil collection (and you probably will), you will be able to save that 24%. When you come across something wonderful, it's natural to want to share it, so when your Premium Starter Kit arrives, and you find out how much you love it, if you share the wonderful things Young Living Products do for you with a friend, and they end up purchasing a PSK, Young Living will send you $50!!! What the whatttt?! Yep. Get $50 for every friend you refer!! Don't worry, you are too. Since I've been introduced to the amazing powers of essential oils, I've decided to incorporate them into our daily life. I knew that by doing that, I'd need a better system than leaving them scattered all over the top of our dresser. I'd seen some really pretty oil storage shelves for upwards of $50, and knew that I'd like something like that, but definitely not for $50 or more. Plus, I'm not exactly sure where I'd want to keep the shelf (kitchen, master bedroom, office), so I wasn't ready to commit to hanging them on the wall anywhere just yet. Last night, Bent and I checked out Goodwill, but they had no shelves, and he felt bad that I came up empty. "It's ok, I'll find the right one," I said as we left. Today, after school, Cole and I went to run errands on the other side of town, so we stopped at a thrift store that we don't usually frequent and guess what they had? A lovely little free standing shelf that can also be hung on the wall and was painted by its previous owner the exact color of the mirror and picture frame hanging in our master bedroom! $5 and a wipe-down later, that cute little shelf is now holding our essential oils. Yes, this could certainly be chalked up to coincidence, but these things happen all the time. Just last month, I was wondering to myself if I should get a crockpot to make dinner time easier since we've been so busy with back to school. I went into Target for groceries, and guess what? Marked down crockpots were on an endcap display! I didn't buy one, but I smiled because I know that those were put in my path because I'd called to them using the power of intention. These situations have happened so often that when I tell people, "Don't worry, things are going to work out fine," I'm not just saying it. I truly believe that they are, because I know that things are always working out for me. In fact, they're always working out for you too, or they will be once you believe that they are. Medical studies have shown that the placebo affect is a real thing. In fact, it accounts for 1/3 of healing in patients. One third!! Your mind is far more powerful than you think. The next time you start to beat yourself up over something, replace your words with positive affirmations because when you tell yourself you are a failure, you become one. Tell yourself that you are awesome, and that good things come easily for you. Even if you don't believe it. Lie to yourself if you must, but over time, that lie will become the truth. You know why? Because you're magic. It's a question I'd wondered for nearly 3 years. Do essential oils really work? 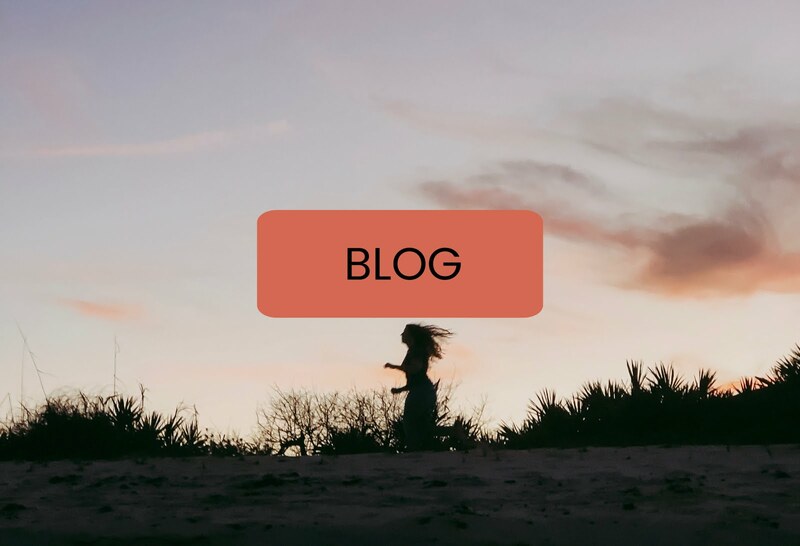 Across social media I'd seen people singing the praises of essential oils for things ranging from headaches to thyroid issues. I'd been curious to try them out, but didn't have the time because I was drowning in orders at the time from my handmade business. 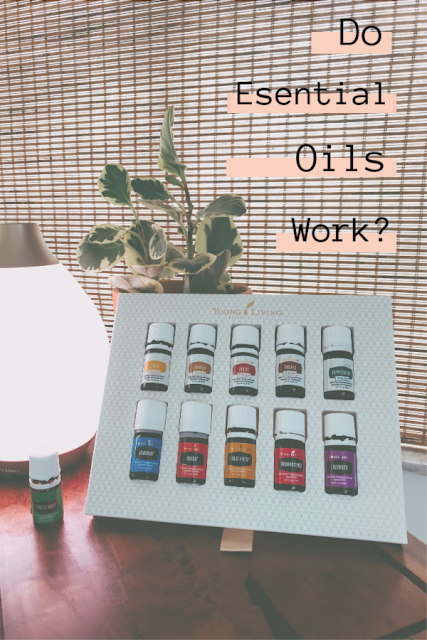 Once I turned my business into a hobby, and had more time, I started tinkering with oils, buying a couple of diffusers and oils from Amazon and Etsy. I'd been hoping to diffuse some in Bent's room to help with his seasonal nighttime asthma, and try out a few other things. I used them for nearly a year and what I found was that they didn't really seem to make any sort of real impact on the issues I was hoping to address. They did smell nice though, so I continued to use them on lava bead bracelets and necklaces, and diffuse them just for scent's sake. ****This is a post sharing my family's personal experiences. I am not a medical doctor, nor can I claim that anyone else would have the same results. Recently, Young Living, the supposed "ultimate" oil brand was having a sale on their premium starter kits, and something in me said, "what the heck, let's try 'em," So I ordered one. With the kids back in school, I have a couple of hours to myself now every morning, so I was pretty excited to experiment with the oils just for the sheer entertainment of it. I was mostly expecting the same results, but to my great surprise, the oils I've tried out so far from Young Living actually do something. Yes, they smell good too, but these have given us actual, real results from the things we've tried. Lavendar + Copaiba: This combo in my youngest's diffuser at night has changed bedtime to an hour long "get back in your bed" fiasco to a 15 minute, "good night, love you" snooze fest. I would never have believed it unless it happened to me. Digize: Rubbing this on our tummies when they're feeling yucky has helped us to feel better. Raven: Mixing this in a roller with a carrier oil and rubbing it on Bent's chest when he feels like he's breathing heavily has given him relief without needing his inhaler. The kit came with 11 oils, the diffuser, a sample of Thieves household cleaner (which made 2 bottles of cleaner!! ), and some Ningxia Red (which I have not yet tried), sample bottles, and the most gorgeous diffuser! We're still working on trying other oils in the kit, but from our experiences so far, I can say, that yes! Essential Oils really work IF you are using quality oils. Apparently, there are no FDA regulations on essential oils, which means that anyone can sell what they call essential oils, regardless of their quality, so oftentimes, the oils you buy from the grocery store or amazon are synthetic, diluted, or just straight up fragrances that have no actual plant oil in them. 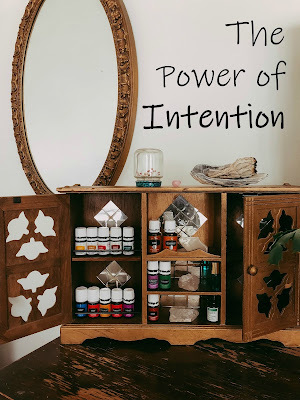 Young Living has a Seed to Seal promise, which means that they control everything from the time the plant is seed to when it's sealed up in the bottle and sent to your home. No other company has that, and apparently it makes a huge difference if you're looking for anything other than scent from your essential oils. 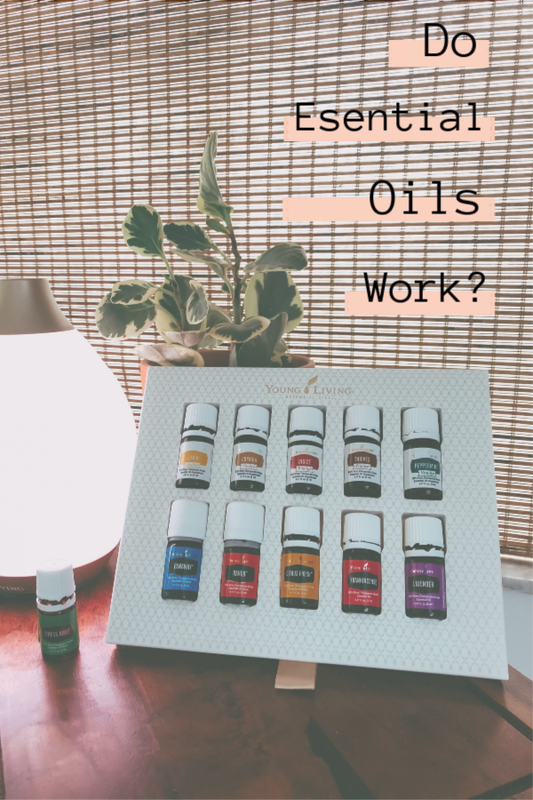 If you'd like to try out Young Living Essential Oils and see what a difference they can make for your family, you can click the link here. Please know that these are my personal experiences, and I never would have believed that the past few weeks would bring me the results that we've received. I am not a medical doctor, and I cannot guarantee results for anyone else, but I wanted to share the experiences that our family has had from Young Living oils. 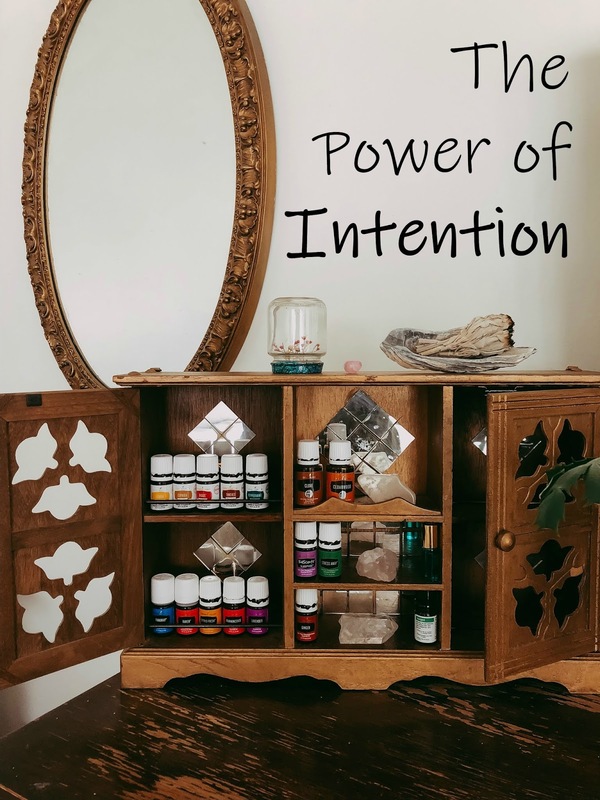 Have you tried Young Living or other brands? Did you notice a difference? I'd love to hear your experiences! It's no secret that I've been in the moccasin game for a few years now. 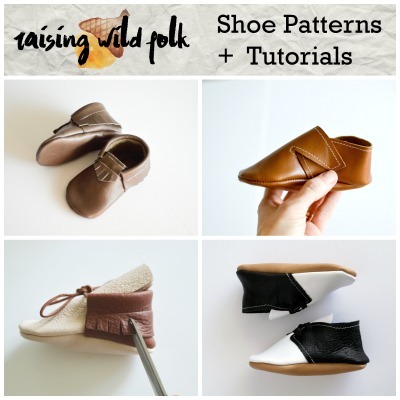 With the decision to put shoe making on the back burner, I thought it would be nice to create a tutorial for making moccasins, in case you're feeling particularly crafty. 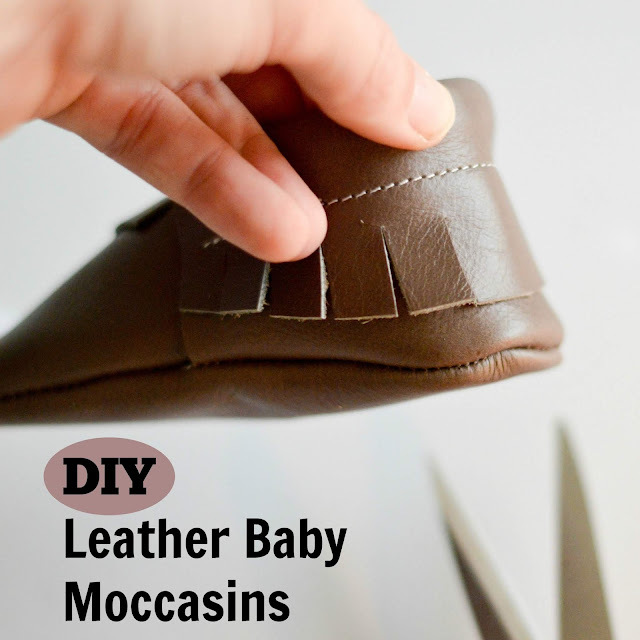 Aside from a couple of fun projects with my Granny, and 8th grade home-ec, I basically taught myself to sew by figuring out how to make leather baby moccasins. Once I found a pattern that worked nicely, I created a variety of sizes. These moccasins can be made by anyone with a sewing machine, depending on how thick your leather is. 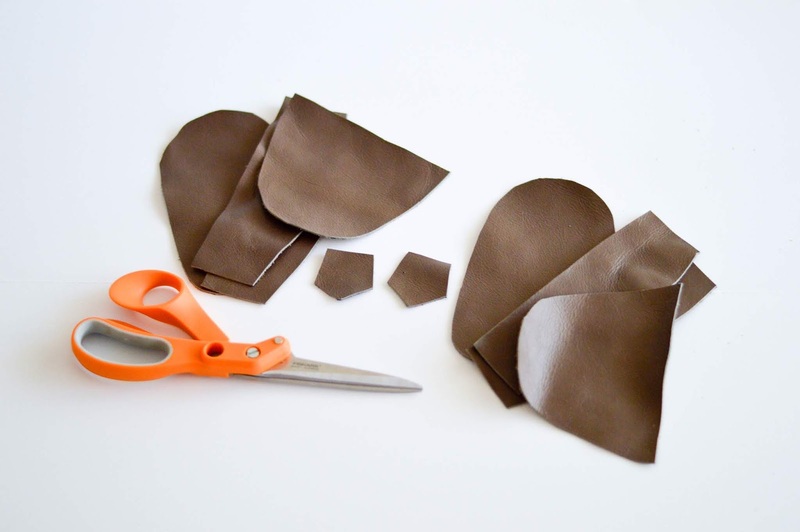 I recommend a leather that is approximately 3 oz, so that it's thick enough to hold up to wear and tear and to protect your child's foot, but won't be too thick to sew with a standard sewing machine. 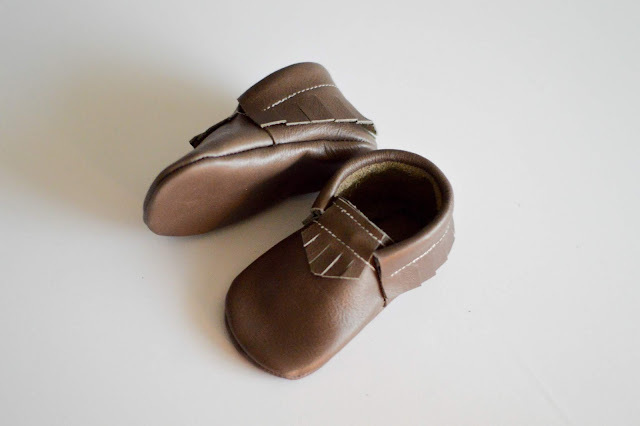 The best part about this pattern, it can easily be adjusted for babes with chubby feet! Simply make the top piece (the one that looks like a hill) wider (like a less-steep hill). You can find the patterns for baby and children's sizes 1-10, along with a step by step tutorial over in the ETSY shop.